Introduction: We take a close look at the Plano 3341 Guide Bag to see just how suitable this tackle storage system is for multiple fishing applications. Stowaways 4 - 3600 "StowAways"
About Plano: Plano has been in the plastics molding business since 1952 and continues to be a dominating force in the storage systems for outdoor activities. Plano manufacturers a huge variety of products ranging from outdoor and tackle boxes to cosmetic storage and custom solutions for OEM orders. Impressions: Plano makes solid products and the Guide Bag is no exception. When we first received the bag our initial opinion was that the bag was built tough. The bag incorporates a solid construction using a rigid plastic frame that acts a shelf for standard Plano 3000 series boxes, and the Guide bag comes with four configurable 3600 stowaways. In addition these stowaways actually fit on the sides of the bag so you can hold up to three more on the outside or store them here for quick access while fishing. For storage of vital items like reels the Guide bag features a padded enclosed top compartment. The Real World Test: We loaded the bag with all the basics and put it to a 4 week test....here's what we found. Configurable System: The Plano Guide Bag comes with 4 configurable plastic 3600 StowAways. These are in fact plastic boxes with plastic tabs that fit in various slots. The nice thing about this system is the ability to customize the boxes to fit small items like terminal tackle and also accommodate odd sized items like a full range of crank-baits. These boxes are built with thick plastic and they really can take a lot of abuse. Dropping them on uneven rock surfaces didn't even make a dent, and over all the tests not a single hinge ever broke. Overall we were quite impressed with these boxes. They are a good size, and best of they are in standard system. So rather then switch out lures for various fishing you can simply buy more boxes (even with different configurations) from Plano's 3000 line and they can be interchanged in the Guide bag's drawer system with ease. Total Storage Capability: The Guide Bag's greatest feature is the use of a rigid frame. This allows any box to be pulled and put back with ease without displacing the other boxes or causing a heavily top weighted bag from sagging over. (If you look back at our review of the Flambeau Tackle Station, this was one of our biggest gripes) Another big plus is the use of a draw cord that snaps quickly over the shelf so even at a slant the boxes will not slide out. The sides of this bag all have extra mesh pockets which can hold 3000 series boxes or anything you want. We chose to use these to organize plastic lure bags. We also tried using the back pocket to hold a net. 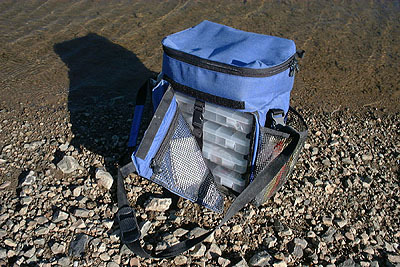 The use of mesh is a big plus when this bag is on the water. Sometimes on rough water when you get splashed getting your bag wet is inevitable. With Plano's mesh design the pockets bag will not take on water, and the enclosed zipped top does a very good job of keeping vital contents dry. On the front pocket there is a flat space well suited for papers (boat registration, fishing license, etc.) On the side are two small thing loops that can be used to hold retractable clippers or other small tools. We definitely would liked to have seen additional Velcro straps to help securely lock in accessories like a net or rod holder. Durability: The Plano Guide Bag employs 600Denier Nylon which is water resistant and thick enough to resist a barrage of attacks from stray hooks and rocks. We deliberately snagged hooks in the surface and pulled them out and surprisingly the material thread did not easily pull loose. The material is of a very good quality and can take a real beating. When used on shore in often wet and muddy conditions the bag would get wet and dirty. The bag's frame is effectively held in with a Velcro strap and the front flap. When both of these are undone the entire frame can be removed and this bag can easily be hand washed in a sink. The material held up well when scrubbed vigorously to remove any traces of dirt. 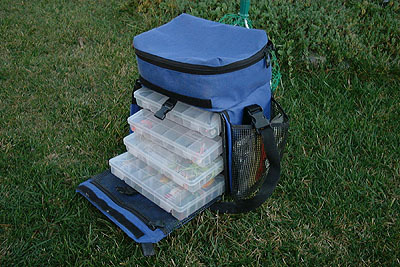 Applications: The Guide Bag does a good job of holding a lot of tackle and organizing it in a quick access format. However, this bag is still best suited for watercraft or shore fishing with limited movement. The reason is that the Guide Bag can become quite heavy when loaded to maximum and there is only one way to carry it...via a shoulder strap. This generates a lot of pressure on the single strap which is thin and only buffered with a slim rubber pad, which unfortunately doesn't offer a great deal of shoulder padding. The addition of more straps, or an additional handle for single handed portability (rather then adjusting the shoulder strap) would have made the Guide Bag more usable for walking along the shore of lakes and rivers and fishing. On a boat when the bag is not being moved the flexibility of customizing stowaways for your trip and the rigid frame make the Guide bag an excellent choice for this application. In fact it is one of the fastest and most organized solutions we have seen to date. Conclusion: Plano's Guide 3341 is a solid bag that will serve you well thanks to a strong construction and flexible storage options. While not the best choice for hiking along rivers and lakes the bag does hold a lot of tackle and excels on watercrafts or in situations when you don't need to move far or much. The rigid frame construction makes pulling the "StowAways" quick and easy, and the configurable boxes make organizing tackle a snap. If the application fits your fishing style this is a good bag, if you want more mobility you will want to keep shopping.